Proven applications in multiple environments: Medical healthcare - Aged care facilities - Food preparation - Household - Travel - Textiles - Veterinary - Preschool - Hotels - Gym - Transport - Carpets. Active ingredient is HD5: pure active in pure water - no stabilizers or preservatives. Easy to use: Hand-held spray - Sanitizer dispenser - Misted on walls, ceilings, linens, carpets - Wiped using cloth or towel. Disinfectants just kills. HD5 kills and protects not only from bacteria and viruses, but also from fungi, molds, algae and protozoa. Eco-friendly HD5 powers Hygiene Pro antimicrobial surface coating and Hygiene 24 hand shield. Kills and protects by lysis - Non-leaching - Non-carcinogenic - Prevents cross-contamination - Non-toxic to humans, pets and plants - Non-corrosive - Adheres to most surfaces - Safe on upholstery, metals, wood, drapes, plastics, stones, porcelain. Clear colorless solution won't stain surface or fabric ?No thickeners, colorants, dyes or additives - No chlorine. No chemical vapors. Applied to surfaces, it produces an invisible, indelible, transparent and durable antimicrobial shield that will actively kill microbes on contact. Approved by US Environmental Protection Agency (EPA), US FDA, and Philippine FDA (BFAD). Bacteria tested and inactivated: acinetobacter - aeromonas - citrobacter - enterobacter - enterococcus - e. coli - klebsiella - legionella - morganella - proteus - pseudomonas - salmonella - serratia - xanthomonas - bacillus - c. diphtheria - micrococcus - mycobacterium - p. acnes - staphylococcus including MRSA - streptococcus. Viruses tested and inactivated: adenovirus II & IV - bovine adenovirus I & IV - feline pneumonitis - herpes simplex I & II - HIV-1 - influenza A2 (Asian) - influenza A2 (Aichi) - influenza B - mumps - parinfluenza (Sendai) - Rous sarcoma - reovirus I - levivirus - Simian virus 40 - vaccinia - MS2 - PRD1. Fungi, algae, molds, yeasts, spores and protozoa tested and inactivated: alterania alternate - aphanizomenon - aspergillus niger, sydowi, terreus, versicolor, verrucaria - aureobasidium pullans - candida albicans, pseudotropocalis - c. cladosporioides - chlorella vulgaris - dreschslera australiensis - epidermophyton - gliomastix cerialis - gloephyllum trabeum - microsporum - monilia grisea - oscillatoria - penicillium chrysogenum, commune, funiculosum, pinophilium, variable - phoma fimeti - pithomyces chartarum - poria placenta - scenedesmus - saccharomyces cerevisiae - scolecobasidium humicola - selenastrum - trichoderma viride - trichophyton interdigitale, maidson, mentogrophytes, cryptosporidium parvum (oocysts). Domuschola is an International Baccalaureate World School for the Primary Years Programme (PYP). IB World Schools all over the world share a common philosophy that is committed to high quality, challenging, international education. This school aims to produce internationally-minded "citizens of the world," where pupils are exposed early on to real-life, day-to-day experiences and tasks, making learning practical and experiential. Understanding the unseen dangers of microbes that can spread disease and harm pupils, Domuschola has gone beyond clean. Last January 2015, it committed to a year-long program of antimicrobial protection using the latest technology and education to make its campus, pupils and faculty germ-free. 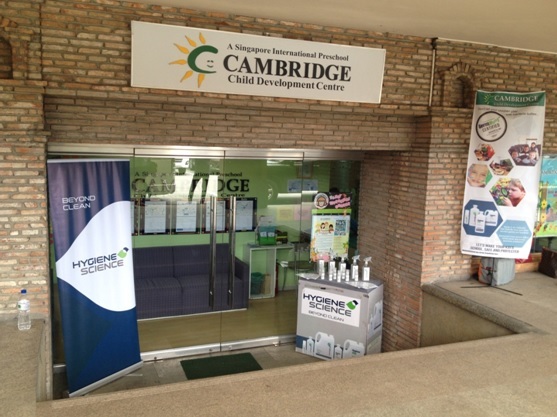 The first international school to embrace Germproof Technology by Hygiene Science, Cambridge Child Development Centre delivers on the commitment to protect your child against unseen dangers—highly-resistant germs that cause sickness, resulting in absences, hospitalization. Every month the classrooms and offices are bio-misted with Hygiene PRO antimicrobial coating that remains active for one month, killing resident germs and new arrivals. While other disinfectants are toxic and don't work once dry or turned off, Hygiene PRO remains bonded on surfaces waiting to kill the next disease and odor-causing microbes. At CAMBRIDGE, protection is taken seriously. Currently under germ control program are Alabang, Makati, BGC, Binondo, Mariposa and Hemady branches. Las Piñas branch will be germproof by Dec 2014; Paranaque and Circulo Verde branches starting Jan 2015. "Going to the hospital has been part of my routine for the past 5 years. I visit my doctor thrice a month. Then I heard about hospital bacteria contamination. Sick people like me should definitely be scared right? Pero ako, no. Kasi I trust my antimicrobial product, Hygiene 24. My son gave it to me as a gift nung birthday ko. I found out that Hygiene 24 provides all-day protection even after hand washing, it is easy to apply, cost effective and gives me a long-lasting protective shield against bacteria exposure and regrowth. Kaya ako, all I have to worry about is taking care of my diabetes. Bacteria infection? Not a problem.". "My work requires me to deal with many applicants everyday. As a professional, shaking their hands is necessary, but doing this makes me vulnerable to germs and bacteria.. I've been searching for years for a product that can promise 24 hour anti-bacterial protection for my hands. Their product, Hygiene 24 is cost effective and works non-stop the whole day with just one application. Using it makes me feel protected and gives me peace of mind." "Dati akala ko okay na alcohol. Hindi pala! I found out na ang alcohol pala, and even sanitizers, are not effective once dry. Thank God I have a friend who uses Hygiene Science products! She uses Hygiene Pro for general house cleaning and she recommended that I try Hygiene 24 for every day use. Once a day application lang and works even after multiple hand washing!". "Simula ng gumamit ako ng Hygiene 24, feeling ko, my hands are protected and moisturized all day! Ang Hygiene Pro naman, I use to clean my house and office. With my work na laging nasa field , importante na may partner ako against bacteria that works 24 hours. Kaya nga this Christmas, i will be giving away this gift of protection to my loved ones." "I am lucky that my children loves and enjoys school. Ang fear ko lang, sa sobrang enjoyment nila, they're not careful anymore if what they touch is clean or NOT. I've also already accepted the fact that on any given day, there will be kids in my children's school who may have acquired a form of contagious condition due to bacteria. Kaya I searched for an antimicrobial product that can protect my child... I found out that there is a new discovery from Hygiene Science that can make my children's hands free from bacteria. One application lang, pang 24 hours protection na". Tanggal lahat ang pag aalala ko. "Kaya everyday whenever I see a parent in school, I do my best to encourage them to use Hygiene Science products"
"Hygiene Pro is my Lucky charm! I started my business this year and from the beginning, I've used Hygiene Pro to clean my restaurant. Food lovers and customers nowadays look for a common quality when it comes to choosing where to eat. It's not just about the food served, they also look for a place that's clean and hygienic. Partner ko to reach my customers' expectations sa cleanliness ang Hygiene Pro. From tables, floors to food storage I use Hygiene Pro. 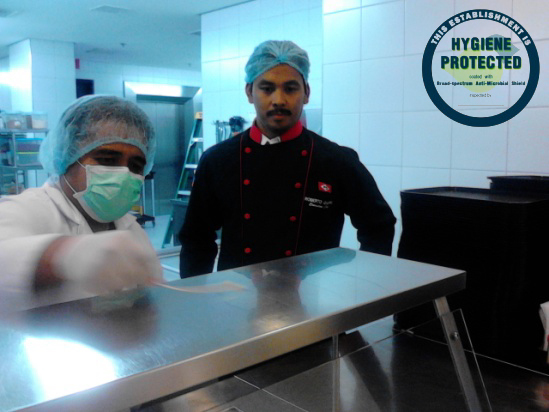 When customers notice that my staff uses Hygiene pro when we do general cleaning, they feel safer and tend to trust our restaurant more'". With Hygiene Pro, my restaurant is bacteria and mold free everyday! "Proper hand washing is the first thing I teach my students. I thought it was the only way to defend ourselves against bacteria. But last month, I learned that hand washing using soap and water, pati na sanitizers, is not totally effective. Since then I started researching and testing different antimicrobial brands for my students. I was looking for a brand that promises 24 hour protection against bacteria, and one product stood out! Hygiene 24 and Hygiene Pro contain an active ingredient that totally eliminates microbes and provide protection for a long period of time even after washing". Hygiene Science Inc (HSI) is Tao's endeavor to be at the leading edge of sanitation solutions. Observing that today's current disinfectant methods and chemicals do not comply with WHO and other standards, HSI offers NASA-level, high-grade, food-safe, broad-spectrum microbe shields for hand, surface and textile disinfection for hospital, industrial, corporate and household use. HSI's mission is simple: go beyond clean by employing the latest in the science of protection in human health and animal health. The company's experts employ scientific techniques that lower sanitation labor cost with prolonged protection against viral, fungal, bacterial and mold exposures. Please fill up the boxes completely. 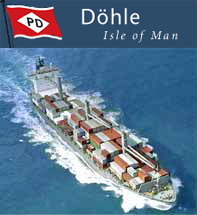 Döhle (IOM) Ltd is a global ship management services business of The Peter Döhle Group headquartered in Hamburg, Germany. The company has offices in Philippines, the Isle of Man, India, Poland, the Ukraine and Romania and provides crew, technical, commercial and corporate management. What is Dohle main activity in the Philippines? "We train our own ship crew for our global shipping services. We have 250 office employees at the present." "Most shipping companies have food establishments. I have to rely on technology and training of my staff to improve our processes that make us ahead of competitors. But beyond this training and knowledge of the manpower and staff I have to have the right chemicals like Hygiene Pro (and "Pro" means "professional" to me). If I have these types of chemicals) I protect my staff and our crew, and I’m proud to know that my kitchen facilities are more advanced". What made you try the Hygiene Pro? "At first I had some doubts about the efficacy of the chemical (Hygiene Pro), but because of the numerous lab tests presented, and the impressive actual tests results in my kitchen, I decided to try it. I have a futuristic approach in our business to try out and fit in the technology. Life is about technology and we have to move forward with it." Did the product increase your disinfection cost? "The way I see it, if I use it as advised it is not too expensive especially if I compare it to the standard product that I am using." 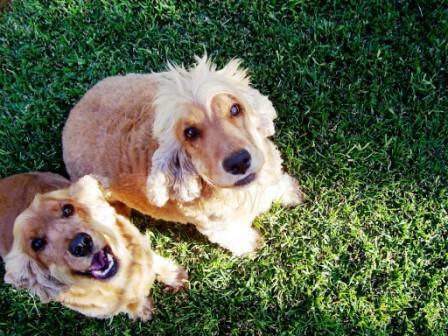 "I found out that Hygiene Pro decreases the number or the volume of chemical that you use, environment friendly and safe on food, which is very important to us." What should the world know about your company? "We are devoted to being a world class ship management company with strong international presence. We are proud of our kitchen (we also call it galley) where we train the chief cook for the vessels, and now we train them in sanitation and hygiene. I think all ship management like companies should test and use Hygiene Pro and Hygiene 24 like we do. It’s really a big disadvantage and sometimes fatal to have sickness out in the sea. What hygiene goals are you trying to achieve? "With what I know and what I've experienced, the concept of antimicrobial coating is more advanced and effective than plain disinfectant. I would like to see Hygiene Pro and Hygiene 24 being used in all the aspects of the building, such as the public areas like toilet and small pantries of the building. I will propose to top management to use them to make the areas safe from all kinds of contaminants. 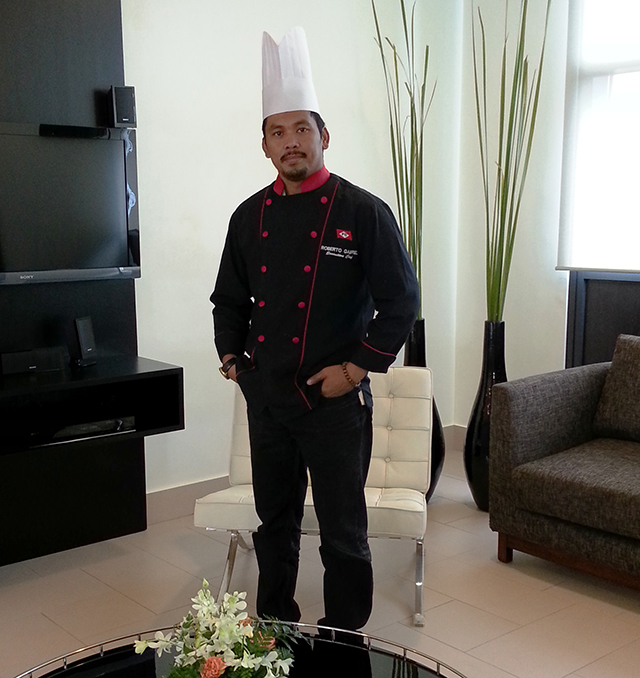 But now my priority is in the kitchen." How do you feel about being "Certified Hygiene-Protected?" "Well in these days, all companies in the same business are ISO certified. It would be to our company's advantage and pride to raise the hygiene standard through better technology, not cost. Being hygiene-certified is another feather on our cap. I am happy and my boss has peace of mind."